A Masai Mara safari will have you see the Big Five (lion, leopard, elephant, rhino, and buffalo) in their natural habitat. You will also be able to see numerous plain game including giraffes, zebras, wildebeests, kongoni, topis, elands, gazelles, impalas among other Kenya wild animals. The Maasai Mara National Reserve or The Mara as it is popularly known is Africa’s greatest wildlife sanctuary and the world’s most famous safari destination. Together with having breathtaking landscapes, it is home to more than 570 species of birds ex., ostriches, pygmy falcons, woodpeckers, hornbills, marabous, vultures and long-crested eagles. The Mara is situated 270 kilometers southeast of Nairobi, the capital of Kenya. It covers 1,510 square kilometers and it is part of the Great Rift Valley, which stretches 4,285 kilometers from Syria to Mozambique. Maasai Mara gets its name from the Maasai tribe, a famous pastoral community that has come to be an international symbol of the African tribal life. It also gets its name from the Mara River, which divides it. During your Masai Mara safari you are almost always guaranteed to see lions. 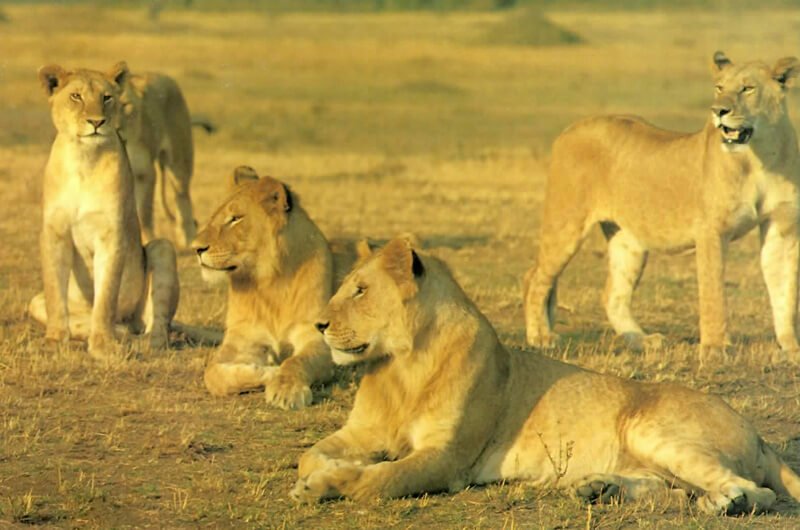 There are over 30 prides of lions and a pride can consist of more than 25 lions. The seventh natural wonder of the world happens in the Mara every year between July and October. During this great migration, over 2 million wildebeests, zebras and gazelles trek from the Serengeti plains in Tanzania right through the reserve in search of water and pasture. Predators such as lions, hyenas, jackals and vultures closely follow the trek. There is also a heavy presence of crocodiles at the place where the herd crosses the Mara River. Hot Air balloons provide an excellent opportunity to take photographs. They lift off at 6:30 a.m. and last for about an hour. During the flight you are more than likely to see four of the Big Five. The view of the sunrise and the picturesque landscape is nothing short of amazing. After the flight, champagne breakfast, complete with flowers is served under an acacia tree. This is then followed by a leisurely game drive en rout to your lodge/camp. A Kenya balloon safaris costs between US$ 455 and US$ 480. You can take a guided walking tour outside the Reserve where there is also plenty of wildlife and interesting sights. A Maasai Moran (warrior) will guide you and you will be able to see different species of birds. Cultural safaris can be arranged to visit the Masai tribesmen. During the tour you are able to visit a traditional Masai homestead or Manyatta and experience a way of life that has remained unchanged for centuries. Horseback safaris can be organized by some lodges and tented camps. On horseback the wild animals accept you as one of their own. There are tailor-made tour packages that take you to Masai Mara and other safari destinations in the country. Tours can be combined with a beach holiday at the coast and customized to meet individual requirements. Accommodation in the Mara ranges from five-star safari lodges to low priced campsites for the budget traveler. Here are some Masai Mara lodges and campsites you can choose from. Driving to the reserve from the capital takes 5 to 6 hours. However, buses reach as fur as Narok, 100 kilometers from the reserve. Flights are available from Nairobi and Mombasa and land at the Masai Mara Airstrip (MRE). Masai Mara flights from Nairobi depart from Wilson Airport (WIL) and take about 45 minutes, whereas flights from Mombasa depart from Moi International Airport (MBA) and take roughly 2 hours. What were the highlights of your visit? Did you come across a particularly nice lodge, a great activity? Share your reviews, adventures and tips with us! I’m very excited…it must be very wonderful to visit Maasai Mara…thanks a lot. In my holidays I must visit and take a trip by a hot-air balloon to see the famous five and other animals…thank you for the knowledge and be blessed.